Damian Godoy, Designated Broker, has been working as a real estate agent/ REALTOR® for several years helping sell and purchase many homes. He is the co-founder of ARGO Investments LLC and Owner and founder of ARGO Real Estate Professionals LLC. 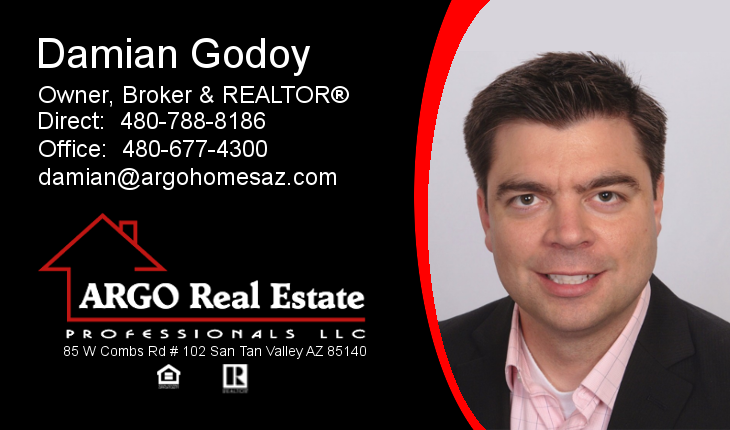 Damian J. Godoy created ARGO Real Estate Professionals on a foundation of Ethics, knowledge and service. He has experienced the ups and downs in the local market here in the Phoenix valley and has helped many homeowners in different situations. He and his family are residents of the southeast valley. Damian has also bought and sold several investment properties of his own and knows what to look for when buying homes. Damian Godoy has a Bachelor degree in Business, a minor in Project Manager and a Masters in Business Administration. Damian is a Broker of the South East Valley Regional Association of REALTORS® and a member of the National Association of REALTORS®. Damian made the Trulia 1% Top Agent Award in 2014 and the 2015 “YPN top 40 under 40” for the SE Valley Association of Realtors (SEVRAR). He was recognized by the mayor of Queen Creek with the BREA award as the "Town of Queen Creek's Top REALTOR" for the 2016 year. If you are looking for trustworthy agents and someone that will go the extra mile for you, this team may be the help you are looking for. They are committed in providing you with the BEST experience when buying or selling a property. Do your own MLS search!! “YPN top 40 under 40” for the SE Valley Association of Realtors (SEVRAR) 2015 & 2016. Recognized by the mayor of Queen Creek with the BREA award as the "Town of Queen Creek's Top REALTOR" for the 2016 year. Trulia 1% Top Agent Award in 2014.